Diamond Systems has unveiled the EPSM-10GX Gbit Ethernet switch module with managed Layer 2/3 switch capabilities in an ultra-compact COM Express Mini 2.2″ x 3.3″ (55 mm x 84mm) form factor. Featuring 24 10/100/1000 Mbps copper twisted pair ports and two 10 Gbps SFI ports, the EPSM-10GX is a well suited for use as a building block for creating custom Ethernet switch solutions in a variety of space-critical applications, such as drones, ground and underwater vehicles and robots. The EPSM-10GX offers managed layer 2+ performance (layer 3 capable with software upgrade) via its built-in 500 MHz MIPS processor and comprehensive suite of software features. All features are manageable via any Ethernet port or an auxiliary “out of band” serial interface. The switch operates at non-blocking wire-speed performance, meaning all ports can operate at full speed simultaneously, resulting in a 44 Gbps total throughput capability. Like a Computer-on-Module, the EPSM-10GX provides the complete core Ethernet switch functionality in a proven solution, vastly simplifying the effort required to design a complete Ethernet switch. The module is intended to be mounted on a carrier board, which requires only the necessary power supplies and “final inch” of magnetics, I/O connectors and SFP+ sockets for the ports. For a complete off-the-shelf solution, Diamond Systems also introduced the EPS-24G2X (EPSM-10GX combined with carrier board) which provides access to all features of the module to create an off-the-shelf complete solution in the industry standard 3.5 inch form factor. For rapid development of custom solutions, Diamond offers under NDA a complete design package for the EPS-24G2X, enabling customers to quickly and easily design a custom solution with minimum risk. The EPSM-10GX is designed to meet the demands imposed by harsh environments and is tested and guaranteed to MIL-STD-202G shock/vibration levels and can be operated in temperatures from -40°C to 85°C. EPSM-10GX is supplied with all required firmware pre-installed and pre-configured, enabling immediate operation without any software development effort. The EPSM-10GX managed 26-Port Gigabit Ethernet Switch Module is shipping now. Microchip Technology has unveiled a new System on Module (SOM) featuring the SAMA5D2 microprocessor (MPU). The ATSAMA5D27-SOM1 contains the recently released ATSAMA5D27C-D1G-CU System in Package (SiP). The SOM simplifies IoT design by integrating the power management, non-volatile boot memory, Ethernet PHY and high-speed DDR2 memory onto a small, single-sided printed circuit board (PCB). There is a great deal of design effort and complexity associated with creating an industrial-grade MPU-based system running a Linux operating system. Even developers with expertise in the area spend a lot of time on PCB layout to guarantee signal integrity for the high-speed interfaces to DDR memory and PHY while complying with EMC standards. The SAMA5D2 family of products provides an extremely flexible design experience no matter the level of expertise. For example, the SOM—which integrates multiple external components and eliminates key design challenges around EMI, ESD and signal integrity—can be used to expedite development time. Customers can solder the SOM to their board and take it to production, or it can be used as a reference design along with the free schematics, design and Gerber files and complete bill of materials which are available online. Customers can also transition from the SOM to the SiP or the MPU itself, depending on their design needs. All products are backed by Microchip’s customer-driven obsolescence policy which ensures availability to customers for as long as needed. The Arm Cortex-A5-based SAMA5D2 SiP, mounted on the SOM PCB or available separately, integrates 1 Gbit of DDR2 memory, further simplifying the design by removing the high- speed memory interface constraints from the PCB. The impedance matching is done in the package, not manually during development, so the system will function properly at normal and low- speed operation. Three DDR2 memory sizes (128 Mb, 512 Mb and 1 Gb) are available for the SAMA5D2 SiP and optimized for bare metal, RTOS and Linux implementations. Microchip customers developing Linux-based applications have access to the largest set of device drivers, middleware and application layers for the embedded market at no charge. All of Microchip’s Linux development code for the SiP and SOM are mainlined in the Linux communities. This results in solutions where customers can connect external devices, for which drivers are mainlined, to the SOM and SIP with minimal software development. The SAMA5D2 family features the highest levels of security in the industry, including PCI compliance, providing an excellent platform for customers to create secured designs. With integrated Arm TrustZone and capabilities for tamper detection, secure data and program storage, hardware encryption engine, secure boot and more, customers can work with Microchip’s security experts to evaluate their security needs and implement the level of protection that’s right for their design. 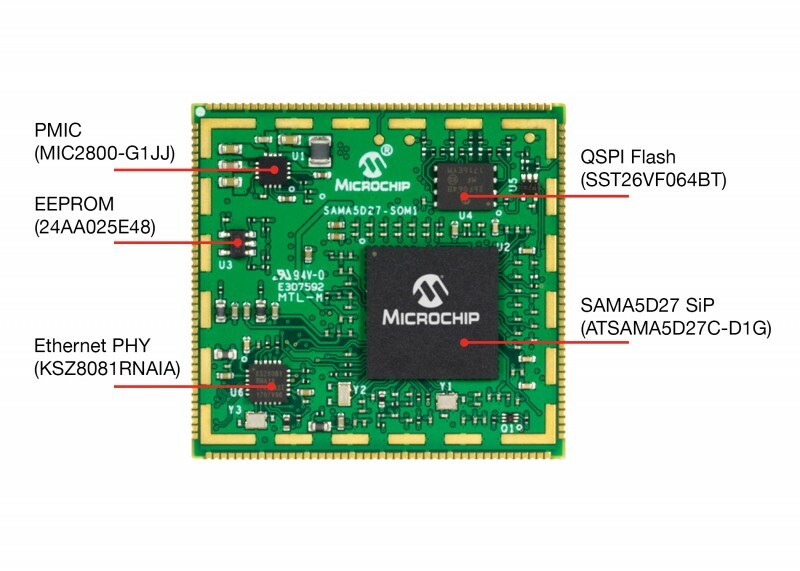 The SAMA5D2 SOM also contains Microchip’s QSPI NOR Flash memory, a Power Management Integrated Circuit (PMIC), an Ethernet PHY and serial EEPROM memory with a Media Access Control (MAC) address to expand design options. The SOM1-EK1 development board provides a convenient evaluation platform for both the SOM and the SiP. A free Board Support Package (BSP) includes the Linux kernel and drivers for the MPU peripherals and integrated circuits on the SOM. Schematics and Gerber files for the SOM are also available. The ATSAMA5D2 SiP is available in four variants starting with the ATSAMA5D225C-D1M- CU in a 196-lead BGA package for $8.62 each in 10,000 units. The ATSAMA5D27-SOM1 is available now for $39.00 each in 100 units The ATSAMA5D27-SOM1-EK1 development board is available for $245.00. Semtech announced that WaterBit, a venture backed precision agriculture irrigation company and National Science Foundation (NSF) grant winner, has incorporated Semtech’s LoRa devices and wireless radio frequency technology (LoRa Technology) into its Autonomous Irrigation Solution (AIS). 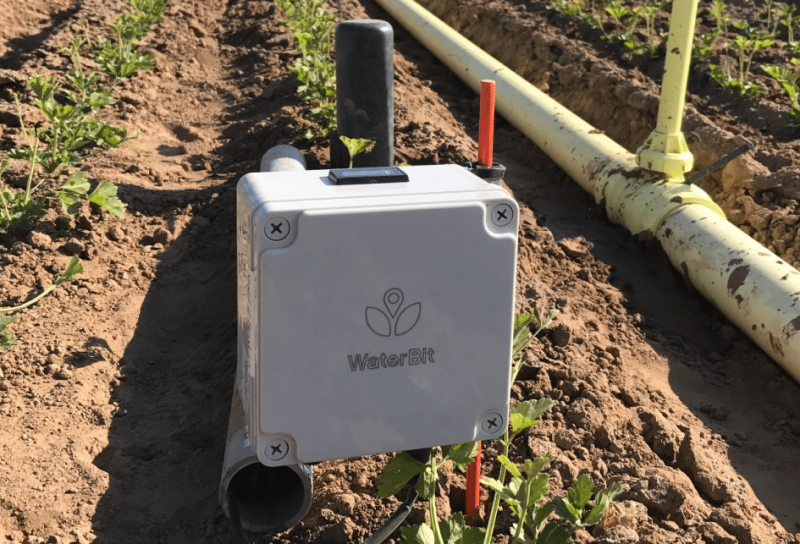 WaterBit provides irrigation automation for growers based on analysis of granular, ground-truth data collected through the WaterBit system, including line pressure and flow, soil moisture and temperature and more. With WaterBit’s AIS, growers maximize yield across soil types, while optimizing the use of labor and other input resources. The complete solution is used across a wide variety of crops including grapes, berries, tree nuts, cotton, corn and leafy greens. WaterBit’s goal when developing its solution was to create the highest quality and most reliable networking product in agriculture. To achieve this, WaterBit eliminated batteries in its production units and enabled duplex communications as well as better control with LoRa Technology. Long Range: A single base station using LoRa Technology enables deep penetration capability for dense urban environments and indoor coverage, while also providing the ability to connect to sensors more than 15-30 miles away in rural areas. Low Power: Enables unprecedented battery lifetime of up to 10 years depending on the application. Geolocation: Enables tracking applications without GPS or additional power consumption. Low Cost: LoRa Technology reduces up front infrastructure investments and operating costs, as well as end-node sensor costs. Open Standard: The LoRaWAN open protocol ensures interoperability among applications, IoT solution providers and telecom operators to speed adoption and deployment. Versalogic has announced a new line of production-ready, ARM-based embedded computers starting with the Tetra. 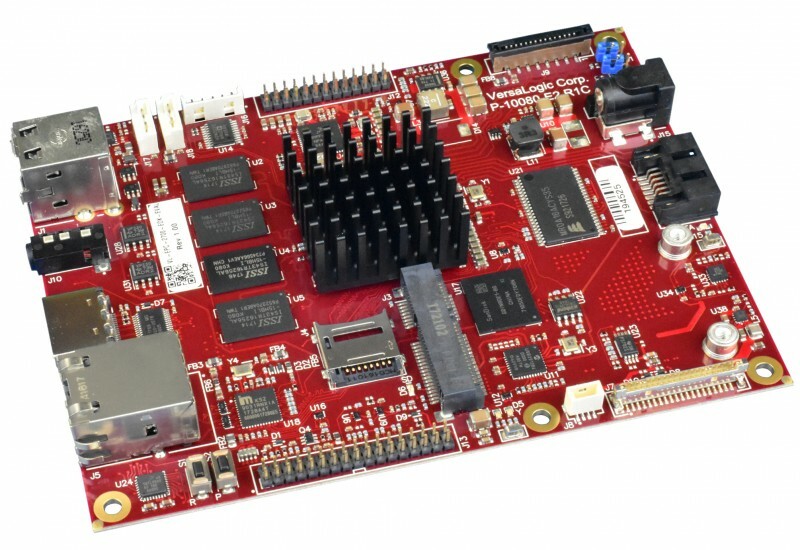 The Tetra is a power-efficient, quad-core SBC. Featuring a quad-core i.MX6 Cortex-A9 32-bit processor, a Tetra typically consumes about 4 W of power when operating (not idle). It is ready for off-the-shelf deployment into demanding industrial applications requiring rugged, long-life, power-efficient, industrial temperature rated (-40° to +85°C) solutions. 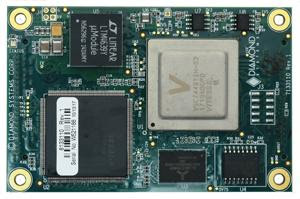 Unlike many ARM-based modules, Versalogic’s new line of ARM-based EPC (Embedded Processing Card) products are complete board-level computers. They do not require carrier cards, companion boards, connector break-out boards or other add-ons to function. For ease of mounting, and future upgrades, Versalogic’s ARM products are designed around the size and mounting points of COM Express products. Unlike proprietary-format ARM products, Versalogic ARM boards provide a standardized mounting pattern now, and simplified upgrading in the future. The Tetra is COM Express Basic size (125 x 95 mm) and offers a variety of I/O options for rugged, industrial applications. The three quad-core Tetra models feature a wide (8 to 17-volt) power input, making it ideal for 12-volt automotive applications. Many applications that require lower power or lower heat dissipation still need very high levels of reliability. Versalogic’s 10+ year formal life-extension program ensures long production cycles free from expensive changes and upgrades that come from short, disposable lifecycles. A variety of on-board I/O includes a Gigabit Ethernet port with network boot capability, HDMI and LVDS video outputs, and two USB 2.0 Ports. Serial I/O (RS-232) and a SATA II interface or mSATA, support high-capacity rotating or solid-state drives. CAN Bus, I2C and SPI are also included along with a 6-axis e-compass, and MIPI camera input. The on-board Mini PCIe socket provides flexible expansion using plug-in Wi-Fi modems, GPS receivers, Ethernet, Firewire, and other mini cards. Designed and tested for Industrial temperature (-40° to +85°C ) operation, Versalogic’s rugged Tetra meets MIL-STD 202G specifications to withstand high impact and vibration. It is engineered and validated to excel in unforgiving environments. Each component is carefully selected to ensure reliable operation in the field. The Tetra, part number VL-EPC-2700, is in stock at both Versalogic Corp. and Digi-Key Corp. OEM quantity pricing starts at $318. Coming to your inbox tomorrow: Circuit Cellar’s Embedded Boards newsletter. Tomorrow’s newsletter content focuses on both standard and non-standard embedded computer boards that ease prototyping efforts and let you smoothly scale up to production volumes. Bonus: We’ve added Drawings for Free Stuff to our weekly newsletters. Make sure you’ve subscribed to the newsletter so you can participate. Already a Circuit Cellar Newsletter subscriber? Great! You’ll get your Embedded Boards newsletter issue tomorrow. Not a Circuit Cellar Newsletter subscriber? CC Newsletter – Sign Up Now! Analog & Power. 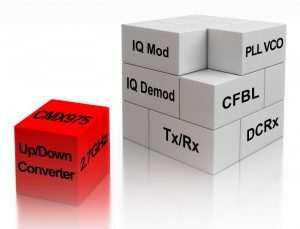 (3/6) This newsletter content zeros in on the latest developments in analog and power technologies including DC-DC converters, AD-DC converters, power supplies, op amps, batteries and more. Microcontroller Watch. (3/13) This newsletter keeps you up-to-date on latest microcontroller news. In this section, we examine the microcontrollers along with their associated tools and support products. IoT Technology Focus. (3/20) Covers what’s happening with Internet-of-Things (IoT) technology–-from devices to gateway networks to cloud architectures. This newsletter tackles news and trends about the products and technologies needed to build IoT implementations and devices. SiFive has launched the industry’s first Linux-capable RISC-V based processor SoC. The company demonstrated the first real-world use of the HiFive Unleashed board featuring the Freedom U540 SoC, based on its U54-MC Core IP, at the FOSDEM open source developer conference. During the session, SiFive provided updates on the RISC-V Linux effort, surprising attendees with an announcement that the presentation had been run on the HiFive Unleashed development board. With the availability of the HiFive Unleashed board and Freedom U540 SoC, SiFive has brought to market the first multicore RISC-V chip designed for commercialization, and now offers the industry’s widest array of RISC-V based Core IP. With the Freedom U540, the first RISC-V based, 64-bit 4+1 multicore SoC with support for full featured operating systems such as Linux, the HiFive Unleashed development board will greatly spur open-source software development. 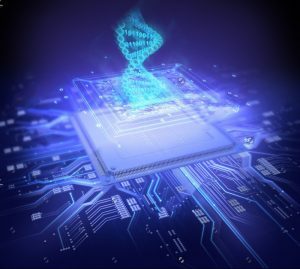 The underlying CPU, the U54-MC Core IP, is ideal for applications that need full operating system support such as artificial intelligence, machine learning, networking, gateways and smart IoT devices. The company also announced its first hackathon, which will be held during the Embedded Linux Conference, March 12 to 14 in Portland, OR. 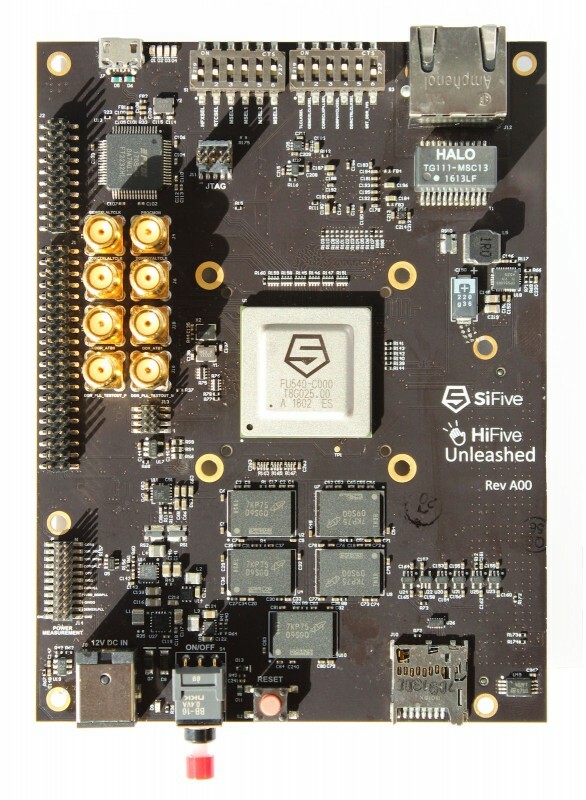 The hackathon will enable registered SiFive Developers to be among the first test out SiFive’s HiFive Unleashed board featuring the U540 SoC. Developers can purchase the HiFive Unleashed development board here. A limited batch of early access boards will ship in late March 2018, with a wider release in June. For more information or to register for the hackathon, visit www.sifive.com/products/hifive-unleashed/. CML Microcircuits has announced the release of the CMX975, a 2.7 GHz Up/Down converter expanding the company’s RF building block IC range.The CMX975 is an enabler for small form factor high frequency RF transceiver designs, operating up to 2.7 GHz, that require high performance and low power consumption; in a small form factor. The device integrates up and down conversion mixers and associated frequency generation circuitry, therefore minimizing the number of external components required to configure a complete system. The device features programmable operation, allowing the designer to fully optimize the system design. Both receive and transmit mixers can be selected to operate as a double balanced mixer stage or as image cancelling mixers, intended to ease external filtering requirements and to lower overall system cost. A flexible switching arrangement allows internal or externally sourced local oscillator signals and the main RF mixers to be driven from an external or integrated VCO. The integrated Fractional-N PLL allows fine frequency resolution and fast frequency lock. An integer-N PLL and VCO is also integrated to provide an IF local oscillator for superhet architecture operation. The CMX975 has programmable power management functionality, controlled via a SPI compatible serial bus, operates from a single 2.7 V to 3.6 V power supply and is available in a small outline VQFN package. The device is ideally suited to applications in mobile satellite services (MSS), military communications, aircraft surveillance systems, high performance ISM radio applications and general purpose RF/IF communication systems. What makes an embedded processor suitable as an IoT or home control device? Wi-Fi support is just part of the picture. Brian has done some Wi-Fi projects using the ESP32, so here he shares his insights about the peripherals on the ESP32 and why they’re so powerful. If you’re interested in IoT or home control devices, you’ve undoubtedly run across Espressif’s ESP8266. The embedded processor became ubiquitous in a very short time. The successor to the ESP8266 is the ESP32 and it’s much more powerful. Like the ESP8266, the ESP32 has on chip Wi-Fi. But it also includes Bluetooth Low Energy (BLE) and sports two high-power cores in place of the single one found on the ESP8266. Having two main cores means one can run the wireless protocol stack on one core, leaving the other core free for the user application program. In fact, Espressif labels the cores “App” and “Pro”, with the latter referring to the Wi-Fi Protocol stack. This feature allows the application program to run without having to worry too much about how much execution time will be needed to handle the incoming/outgoing Wi-Fi data stream (which is hard to reliably predict, due to its asynchronous nature). 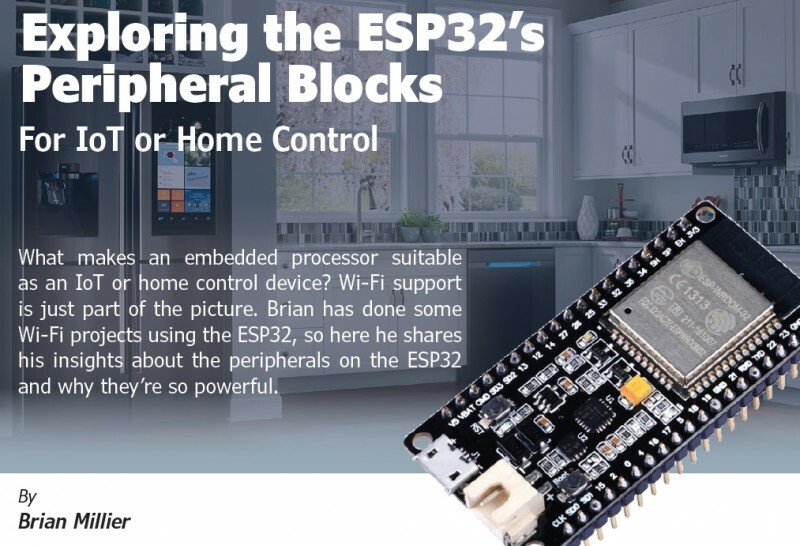 However, in addition to the dual cores, the ESP32 is also blessed with many unique peripheral blocks—most of which operate at a high level and thus require little or no MCU intervention during normal operation. This makes it much easier to write code for projects that have time-critical I/O operations. To appreciate the versatility of the ESP32’s peripheral function blocks, you have to dig into its Technical Reference Manual (TRM). At less than 600 pages, the ESP32’s TRM is somewhat leaner than most new 32-bit MCUs, so I didn’t mind studying it. Wi-Fi, webserver, web client and UDP client libraries are available. I’ve done a few ESP32 Wi-Fi projects using these libraries, and found them to be straightforward. With all that in mind, in this article I am going to concentrate on three peripheral blocks that I consider to be very powerful and useful. I’ll present some code examples and custom libraries that I have written that make use of these peripherals—sometimes in ways that are different from their intended use). I’ll also briefly discuss the I2S and DAC/Cosine Generator blocks and provide some routines that enable you to generate some useful signals using these blocks. The most serious work being done with the ESP32 centers on Espressif’s own IDF/C toolchain. But many people prefer to use the Arduino libraries developed for the ESP32, because they are accustomed to using it with many different MCUs—like AVR, ARM and ESP8266/32. Personally, I use the Visual Micro add-in to Visual Studio. It provides a much more professional development environment, while still using the Arduino tool-chain “under the hood.” All references to library files/folders or sample programs can be found on Circuit Cellar’s article materials webpage. This is a simplified block diagram of the ESP32 Remote Controller peripheral. Don’t miss out on upcoming issues of Circuit Cellar. Subscribe today! Note: We’ve made the October 2017 issue of Circuit Cellar available as a free sample issue. In it, you’ll find a rich variety of the kinds of articles and information that exemplify a typical issue of the current magazine. 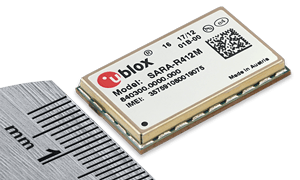 U‑blox has announced the SARA‑R412M, an LTE Cat M1, NB‑IoT, and quad‑band 2G (EGPRS) module with worldwide coverage. Measuring just 16 x 26 mm, the module is the world’s smallest to provide both LTE and quad‑band EGPRS support in a single design. The flexibility extends further with dynamic system selection as Cat M1, NB‑IoT, and EGPRS in single mode or as a preferred connection that does not require a module reboot to switch between modes. 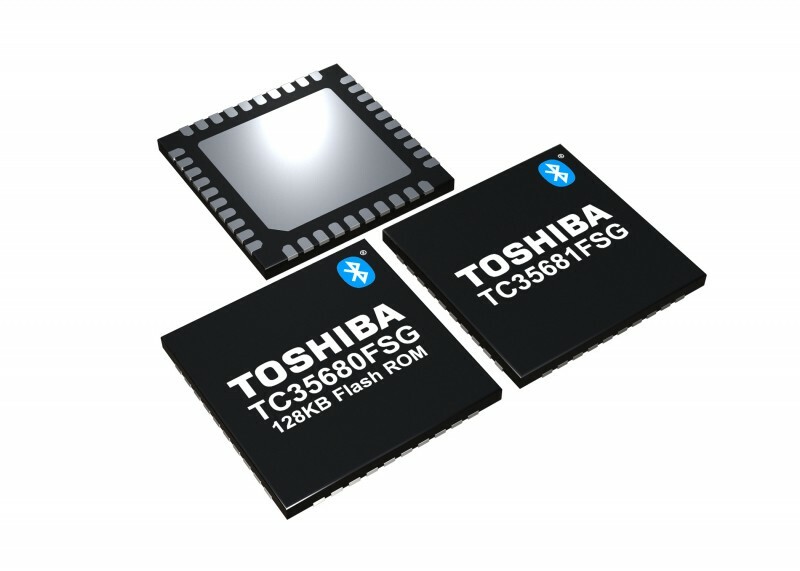 It brings a rich feature suite optimized for LPWA (low‑power wide‑area) IoT applications that require the assurance of 2G connectivity to guarantee broad geographic coverage, even in areas where LTE Cat M1 and NB‑IoT are not widely available yet. New IoT devices deployed in the field today can activate on existing 2G networks and still leverage the benefits of LTE Cat M1 and NB‑IoT technology once it becomes available. The SARA‑R4 series covers a whole host of IoT applications, especially those reliant on long‑term, low power use or requiring connectivity deep within buildings. Examples include gas, water, and electricity metering, city street lighting, building automation, HVAC (heating, ventilation, and air conditioning), industrial monitoring and control, telematics, insurance, asset and vehicle tracking, security systems, alarm panels, outpatient monitoring, and many consumer wearables. SARA‑R412M enables global solutions based on a single hardware version, allowing developers to select their own desired frequencies and operator configurations. SARA‑R412M ensures data integrity between applications via secure communication protocols, notably including two‑way authentication between client and server, a strategy often used with cloud services. Critical firmware updates can be delivered with the u‑blox proprietary uFOTA (firmware over the air) client/server solution that uses LWM2M, a light and compact protocol that is ideal for IoT applications. This allows end‑users to continue using the same hardware when features and functionalities are updated, making it well‑suited for critical applications running on devices that may be deployed in the field over long periods of time. SARA‑R412M provides an extended temperature range of -40 to +85°C, and supports Power Save Mode (PSM) and Extended Discontinuous Reception (e‑DRX) for LTE Cat M1 and NB‑IoT connectivity, which can extend battery lifetime for up to 10 years. 3GPP Coverage Enhancement allows the module’s Cat M1 connectivity to reach deeper into buildings and basements, and even underground with NB‑IoT when compared to other air interface technologies such as GSM or Cat 1. As IoT designs proliferate, security is lagging. Hardware-based security using physically unclonable function (PUF) circuitry strongly protects connected products against invasive attacks. A cryptographic key is generated only when needed and isn’t stored on the secure IC. Even probing the chip impedes the attack. While DNA connects us to every other human being on the planet, it also makes each of us unique. That uniqueness has proven to be useful as a means of positive identification. For example, DNA-based evidence has exonerated some from erroneous convictions and provided verification of guilt in other cases. The DNA that we all carry as unique identification contrasts greatly with what happens in the technology world. In technology, it’s an imperative for every instance of a type of device to be identical, right down to the last micron, microvolt, and byte. Every device must look, feel, and act the same. After all, it’s important to deliver a consistent user experience. However, this sameness is not ideal when it comes to security. When every device is identical, how can we know whether messages that claim to come from a particular device actually do? It is possible that those messages might originate from an impersonator. For example, consider a door secured with an access keypad. The door actuator might receive a message from the keypad that the correct code had been entered, and that the door should be opened. But how can the actuator validate that the message is authentic? For us humans, engaged in face-to-face communications, these questions are non-issues. We know the person we’re talking to because we know how they look and how they sound. In other words, we know the expressions in their physical characteristics of the DNA that makes each of us unique. Imagine the possibilities if our devices possessed that kind of uniqueness. Indeed, even with devices, there is a way, and that way can be found in physically unclonable function (PUF) technology. While each device may function in an identical way, devices with PUF technology contain an element that makes each of them unique. Deep inside devices equipped with this technology is a circuit element that measures certain physical characteristics of the chip itself. These physical characteristics are stable over time, but they do vary from device to device. The PUF technology logic uses these device-specific variations to compute a value that remains the same every time it’s computed, but that is unique to the particular instance of the device. This value serves as each device’s unique identifier, in the same way that your DNA uniquely identifies you. Before deploying the sensor, you could program in a secret, like a password. When the sensor sends a message, it would incorporate this password into the message in some agreed-upon way. Once you’ve received the message, you could check to ensure that the password was sent correctly before accepting the message. Trouble arises when that same password is used for all such sensors. This scenario would make it easy for a cybercriminal to reverse-engineer the device in order to steal the password. Then, the hacker is free to impersonate messages from any device of that type. An even scarier situation happens when the password is sent without cryptographic protection. Then, a cybercriminal can simply eavesdrop on a conversation in order to steal the password. No need to touch the device at all. They could then impersonate any sensor anywhere they are deployed. Clearly, shared secret schemes are too vulnerable to attack. By programming a private key into your device, your device can digitally sign messages with the private key that can be verified using a corresponding public key. This approach enables messages to be authenticated with near certainty. It is practically impossible to modify or forge a signed message. In other words, there is no known way to impersonate a signer in any reasonable amount of time without the signer’s private key. The vulnerability in this approach lies in the fact that the secret, private key has to live somewhere in the memory space of the target device. And if an attacker can slip in malware, it’s easy for the malware to leak the private key. Once the malware is developed, firmware update mechanisms can be used to propagate the malware. Before you know, a large set of the affected devices could be compromised. PUF technology represents the most secure option because its private key is never disclosed, not even to its owner. The private key is only generated when needed (when a message is ready to be signed), and it is never stored (it is immediately destroyed when no longer needed). The computed value never appears in the microcontroller’s memory map. There are various ways in which you can use PUF technology. For instance, before a device manufacturer deploys an internet of things (IoT) device, it can command the hardware containing PUF technology to compute a public key that corresponds to the PUF technology value – the private key. The actual PUF technology value is never disclosed. The device manufacturer then signs the public key with their own corporate private key to create a certificate that they then write back to the device. That certificate can later prove that the public key that the device presents is the same one that was computed at the factory, because nobody can create a valid certificate without the corporate private key. Once deployed, when the IoT device wants to send a message, it can sign the message by recomputing the PUF technology value, using that value as the private key. If the message receiver has the public key for that device, it can verify, with a high degree of assurance, that the message is authentic, unmodified, and came from that particular device. Now, we’ve got millions (and growing) of IoT devices in the wild. There really isn’t a single database that tracks the public key belonging to every IoT device. Anyone receiving a message from an IoT device probably doesn’t have that particular device’s public key. However, they can request the device’s public key certificate from the device itself. When the device sends the certificate, the receiver can check the validity of the certificate via a two-step process. First, the receiver can verify the certificate’s signature using the signer’s public key. Second, assuming the certificate has proven valid, the receiver can test the validity of the device’s message by using the public key contained in the certificate. This entire process takes less than a second. So, you might be wondering, is PUF technology secure enough? The answer to this question lies in the fact that the private key doesn’t even exist until the physical properties of the chip are measured. Even then, the private key is destroyed when it is no longer needed. The private key can’t be discovered by using rogue firmware because the private key only exists in secured, walled-off hardware, not in the actual memory space of the microcontroller. Probing the chip itself will change the characteristics that are measured to determine the PUF technology value, further impeding this type of attack. Figure 1: Block diagram of ChipDNA physically unclonable function (PUF) technology, which provides strong protection against invasive attacks. Maxim’s PUF circuitry takes advantage of the naturally occurring random analog characteristics of fundamental MOSFET devices to produce cryptographic keys. The solution, called ChipDNA technology (Figure 1), ensures that the unique binary value generated by each PUF circuit is guaranteed to be repeatable over temperature and voltage and as the device ages. 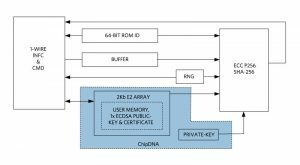 ChipDNA technology is available in the DS28E38 DeepCover secure authenticator. 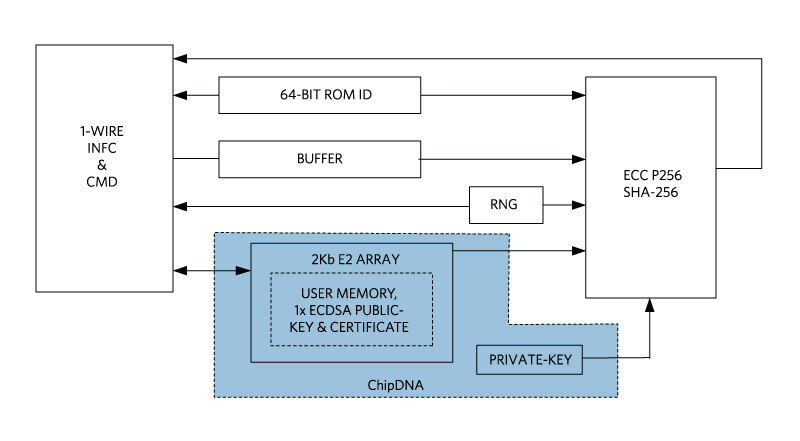 To learn more about how ChipDNA works, you can read the white paper, “How Unclonable, Turnkey Embedded Security Protects Designs from the Ground Up;” watch a video; and see use cases by visiting the ChipDNA webpage. The rise of botnets targeting the Internet of Things has emerged as a clear and present danger for rapidly growing new industries such as home automation, smart cities, and industrial networking. How best can you protect your devices and embedded systems against the IoT botnets invasion? The ESP32-Sense Kit is a new touch-sensor development kit produced by Espressif Systems. It can be used for evaluating and developing the touch-sensing functionality of ESP32. The ESP32-Sense Kit consists of one motherboard and several daughterboards. The motherboard is made up of a display unit, a main control unit and a debug unit. 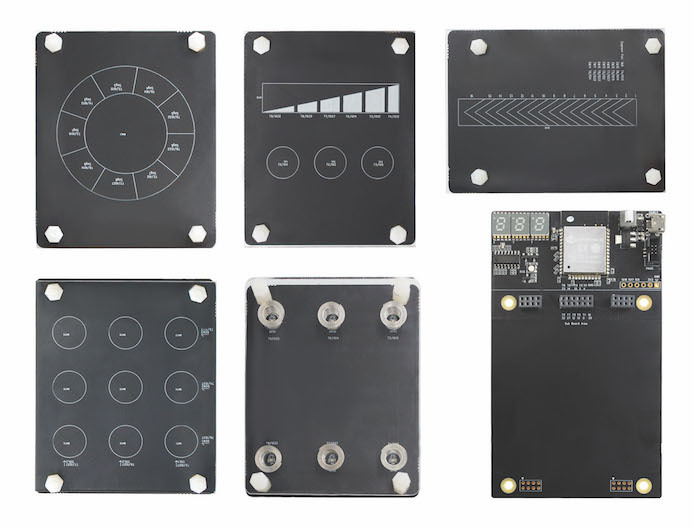 The daughterboards can be used in different application scenarios, since the ESP32-Sense Kit supports a linear slider, a duplex slider, a wheel slider, matrix buttons, and spring buttons. Users can even design and add their own daughterboards for special use cases. The photo provides an overview of the ESP32-Sense Kit. The wheel slider, linear slider, duplex slider, motherboard, spring buttons, and matrix buttons, are shown in a clockwise direction. The ESP32 SoC offers up to 10 capacitive I/Os that detect changes in capacitance on touch sensors due to finger contact or proximity. The chip’s internal capacitance detection circuit features low noise and high sensitivity. It allows users to use touch pads with smaller area to implement the touch detection function. Users can also use the touch panel array to detect a larger area or more test points. ESP32 t=Touch-Sensor Design: The reference design manual of the ESP32 touch-sensing system. ESP32-Sense Project: Contains programs for the ESP32-Sense Kit, which can be downloaded to the development board to enable the touch-sensing function. ESP-IDF: The SDK for ESP32. Provides information on how to set up the ESP32 software environment. 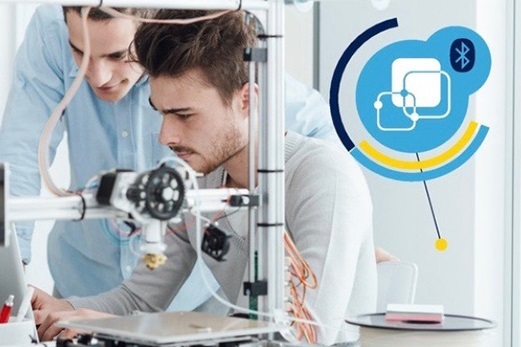 STMicroelectronics has announced the availability to all–including students, makers, and budding engineers and computer scientists–of the online “Introduction to Embedded Systems with SensorTile” course. With a curriculum developed by Professor William Kaiser at the University of California, Los Angeles (UCLA), and used to teach his freshman engineering class, the online course resources provide a foundation to understand the fundamentals of a sensor-based Internet of Things (IoT)-enabled embedded system. Professors at other universities are also encouraged to adapt and contribute to the course. The introductory course of 8 self-paced tutorials is designed around ST’s SensorTile, a unique real-time IoT-enabled embedded system on a postage-stamp-sized module. The tiny 13.5 mm x 13.5 mm module combines a high-performance, low-power STM32 Arm-Cortex-M-core microcontroller, 5 valuable MEMS (Micro-Electro-Mechanical Systems) sensors—an inertial sensor containing an accelerometer and gyroscope, an eCompass, a pressure sensor, and a microphone—and a Bluetooth network processor. A kit with the module, cables, cradle and a battery is available from major resellers for about $80. Coming to your inbox tomorrow: Circuit Cellar’s IoT Technology Focus newsletter. Tomorrow’s newsletter covers what’s happening with Internet-of-Things (IoT) technology–-from devices to gateway networks to cloud architectures. This newsletter tackles news and trends about the products and technologies needed to build IoT implementations and devices. You’ll get your IoT Technology Focus newsletter issue tomorrow. Embedded Boards. 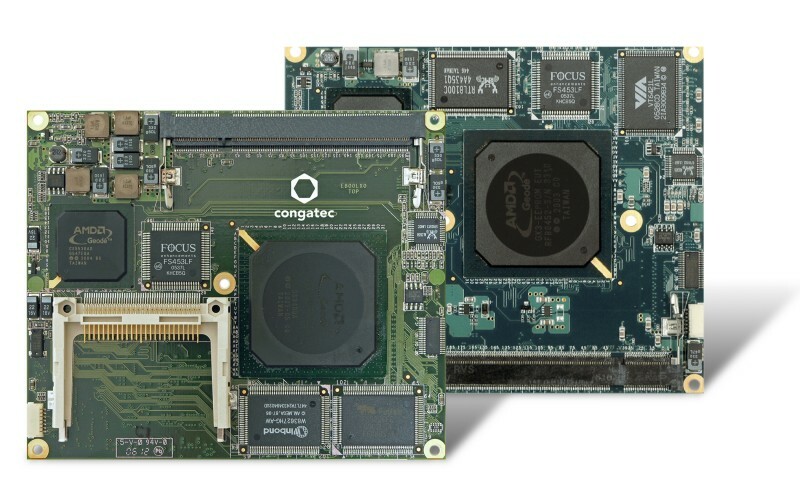 (2/27 Wednesday) The focus here is on both standard and non-standard embedded computer boards that ease prototyping efforts and let you smoothly scale up to production volumes. Microcontroller Watch (3/13) This newsletter keeps you up-to-date on latest microcontroller news. In this section, we examine the microcontrollers along with their associated tools and support products. Analog Devices has announced the Power by Linear LTM4646, a dual 10 A or single 20 A output, step-down µModule point-of-load regulator from 5V or 12V input supply rails. The LTM4646 includes the inductors, MOSFETs, a DC/DC controller and supporting components and is housed in a 11.25 mm x 15 mm x 5.01 mm BGA package. 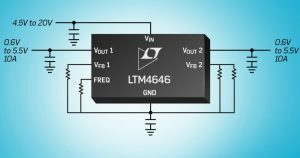 Compared to the prior 2 x single 10 A output module solutions, the LTM4646 reduces the solution size of more than 25%. With its dual regulator design, small package size, and precise voltage regulation, the LTM4646 meets the PCB area constraints of densely populated system boards to power low voltage and high current devices such as FPGAs, ASICs, microprocessors and GPUs. Applications include PCIe boards, communication infrastructure, cloud computing-based systems, as well as medical, industrial, and test and measurement equipment. Total output voltage DC accuracy is guaranteed at ±1.5% over line, load and temperature (–40°C to 125°C). Moreover, the onboard remote sense amplifiers on both outputs compensate for voltage drop caused by trace impedance of the PC board due to large load currents. The LTM4646 has selectable internal or external feedback loop compensation, enabling users to optimize loop stability and transient performance while minimizing the number of output capacitors. The peak efficiency at 12 VIN to 1.0 VOUT is 86%. With 200LFM air flow, the LTM4646 delivers a full 20A continuously up to 85°C ambient. The current mode architecture allows multiphase parallel operation to increase output current with very good current sharing. 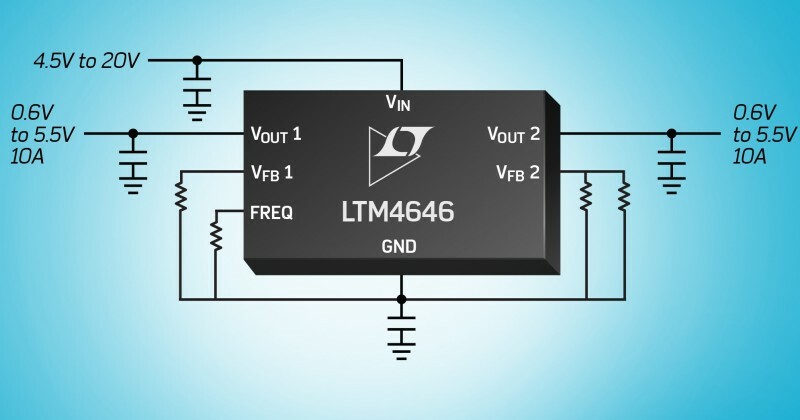 Standalone, the LTM4646 operates from 4.5 V to 20 V input range. When 5 V external bias is available, the device can operate from 2.375 V. The output voltages are adjustable from 0.6 V to 5.5 V, enabling the device to generate not only low voltage for digital devices but also 2.5 V, 3.3 V and 5V, which are commonly needed in system bus voltages. The switching frequency can be programmed from 250 kHz to 1.3 MHz with one resistor, and can also be synchronized to an external clock ranging from 300 kHz to 1 MHz for noise-sensitive applications. Additionally, it features overvoltage and overcurrent protection. The LTM4646 operates from –40°C to 125°C.